Audrey Hepburn (born Audrey Kathleen Ruston; 4 May 1929 – 20 January 1993) was a British actress, model, dancer and humanitarian. Recognised as a film and fashion icon, Hepburn was active during Hollywood's Golden Age. She was ranked by the American Film Institute as the third-greatest female screen legend in Golden Age Hollywood, and was inducted into the International Best Dressed List Hall of Fame. Born in Ixelles, Brussels, Hepburn spent her childhood between Belgium, England, and the Netherlands. In Amsterdam, she studied ballet with Sonia Gaskell, before moving to London in 1948, continuing her ballet training with Marie Rambert, and then performing as a chorus girl in West End musical theatre productions. 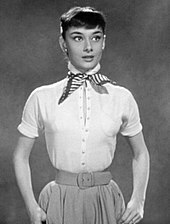 Following minor appearances in several films, Hepburn starred in the 1951 Broadway play Gigi, after being spotted by French novelist Colette, on whose work the play was based. 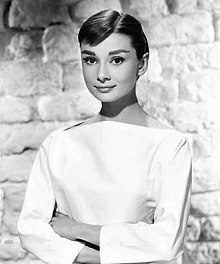 Audrey Hepburn was born Audrey Kathleen Ruston or Edda Kathleen Hepburn-Ruston on 4 May 1929 at number 48 Rue Keyenveld in Ixelles, Brussels, Belgium. Her father, Joseph Victor Anthony Ruston (21 November 1889 – 16 October 1980), was a British subject born in Auschitz, Bohemia, Austria-Hungary. [lower-alpha 1] He was the son of Victor John George Ruston, of British and Austrian descent and Anna Wels, of Austrian descent. 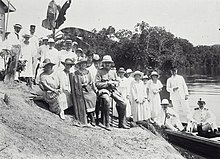 In 1923–24, Joseph had been an honorary British consul in Semarang in the Dutch East Indies and prior to his marriage to Hepburn's mother he had been married to Cornelia Bisschop, a Dutch heiress. Although born with the surname Ruston, he later double-barrelled his name to the more "aristocratic" Hepburn-Ruston, mistakenly believing himself descended from James Hepburn, third husband of Mary, Queen of Scots. Hepburn's parents were married in Batavia in September 1926. At the time, Ruston worked for a trading company, but soon after the marriage, the couple relocated to Europe, where he began working for a loan company. After a year in London, they moved to Brussels, where he had been assigned to open a branch office. After three years spent travelling between Brussels, Arnhem, The Hague and London, the family settled in the suburban Brussels municipality of Linkebeek in 1932. Hepburn's early childhood was sheltered and privileged. As a result of her multinational background and travelling with her family due to her father's job,[lower-alpha 2] she learned five languages: Dutch and English from her parents, and later varying degrees of French, Spanish, and Italian. After her uncle's death, Hepburn, Ella and Miesje left Arnhem to live with her grandfather, Baron Aarnoud van Heemstra, in nearby Velp. Around that time Hepburn performed silent dance performances in order to raise money for the Dutch resistance effort. It was long believed that she participated in the Dutch resistance itself, but in 2016 the Airborne Museum 'Hartenstein' reported that after extensive research it had not found any evidence of such activities. However, in 2018 forthcoming book Dutch Girl: Audrey Hepburn and World War II, author Robert Matzen claimed he found proof she had directly supported the resistance. In addition to other traumatic events, she witnessed the transportation of Dutch Jews to concentration camps, later stating that "more than once I was at the station seeing trainloads of Jews being transported, seeing all these faces over the top of the wagon. I remember, very sharply, one little boy standing with his parents on the platform, very pale, very blond, wearing a coat that was much too big for him, and he stepped on the train. I was a child observing a child." Later that year, Hepburn moved to London to take up a ballet scholarship with Ballet Rambert, which was then based in Notting Hill. [lower-alpha 3] She supported herself with part-time work as a model, and dropped "Ruston" from her surname. After she was told by Rambert that despite her talent, her height and weak constitution (the after-effect of wartime malnutrition) would make the status of prima ballerina unattainable, she decided to concentrate on acting. While Ella worked in menial jobs to support them, Hepburn appeared as a chorus girl in the West End musical theatre revues High Button Shoes (1948) at the London Hippodrome, and Cecil Landeau's Sauce Tartare (1949) and Sauce Piquante (1950) at the Cambridge Theatre. During her theatrical work, she took elocution lessons with actor Felix Aylmer to develop her voice. After being spotted by a casting director while performing in Sauce Piquante, Hepburn was registered as a freelance actress with the Associated British Picture Corporation. She appeared in the BBC Teleplay The Silent Village, and in minor roles in the 1951 films One Wild Oat, Laughter in Paradise, Young Wives' Tale, and The Lavender Hill Mob. In 1953 she was cast in her first major supporting role in Thorold Dickinson's The Secret People (1952), as a prodigious ballerina, performing all of her own dancing sequences. Hepburn next starred as New Yorker Holly Golightly, in Blake Edwards's Breakfast at Tiffany's (1961), a film loosely based on the Truman Capote novella of the same name. Capote disapproved of many changes that were made to sanitise the story for the film adaptation, and would have preferred Marilyn Monroe to have been cast in the role, although he also stated that Hepburn "did a terrific job". The character is considered one of the best-known in American cinema, and a defining role for Hepburn. The dress she wears during the opening credits is considered an icon of the twentieth century and perhaps the most famous "little black dress" of all time. Hepburn stated that the role was "the jazziest of my career" yet admitted: "I'm an introvert. Playing the extroverted girl was the hardest thing I ever did." She was nominated for an Academy Award for Best Actress for her performance. Hepburn next appeared opposite Cary Grant in the comic thriller Charade (1963), playing a young widow pursued by several men who chase the fortune stolen by her murdered husband. 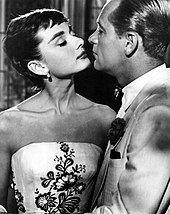 The 59-year-old Grant, who had previously withdrawn from the starring male lead roles in Roman Holiday and Sabrina, was sensitive about his age difference with 34-year-old Hepburn, and was uncomfortable about the romantic interplay. To satisfy his concerns, the filmmakers agreed to change the screenplay so that Hepburn's character romantically pursued his. The film turned out to be a positive experience for him; he said, "All I want for Christmas is another picture with Audrey Hepburn." The role earned Hepburn her third, and final, competitive BAFTA Award, and another Golden Globe nomination. 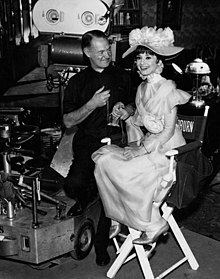 Critic Bosley Crowther was less kind to her performance, stating that, "Hepburn is cheerfully committed to a mood of how-nuts-can-you-be in an obviously comforting assortment of expensive Givenchy costumes." Hepburn reteamed with her Sabrina co-star William Holden in Paris When It Sizzles (1964), a screwball comedy in which she played the young assistant of a Hollywood screenwriter, who aids his writer's block by acting out his fantasies of possible plots. Its production was troubled by a number of problems. Holden unsuccessfully tried to rekindle a romance with the now-married Hepburn, and his alcoholism was beginning to affect his work. After principal photography began, she demanded the dismissal of cinematographer Claude Renoir after seeing what she felt were unflattering dailies. Superstitious, she also insisted on dressing room 55 because that was her lucky number and required that Hubert de Givenchy, her long-time designer, be given a credit in the film for her perfume. Dubbed "marshmallow-weight hokum" by Variety upon its release in April, the film was "uniformly panned" but critics were kinder to Hepburn's performance, describing her as "a refreshingly individual creature in an era of the exaggerated curve". The press further played up the fabricated rivalry between Hepburn and Andrews, when the latter won an Academy Award for Mary Poppins at the 37th Academy Awards (1964) while Hepburn was not even nominated, despite My Fair Lady's accumulation of eight out of a possible twelve awards. Regardless, critics greatly applauded Hepburn's "exquisite" performance. 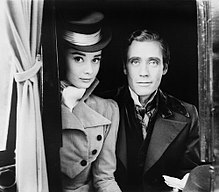 Crowther wrote that, "The happiest thing about [My Fair Lady] is that Audrey Hepburn superbly justifies the decision of Jack Warner to get her to play the title role." Gene Ringgold of Soundstage also commented that, "Audrey Hepburn is magnificent. She is Eliza for the ages", while adding, "Everyone agreed that if Julie Andrews was not to be in the film, Audrey Hepburn was the perfect choice." In 2002, at the United Nations Special Session on Children, UNICEF honoured Hepburn's legacy of humanitarian work by unveiling a statue, "The Spirit of Audrey", at UNICEF's New York headquarters. Her service for children is also recognised through the US Fund for UNICEF's Audrey Hepburn Society. Hepburn was noted for her fashion choices and distinctive look, to the extent that journalist Mark Tungate has described her as a recognisable brand. When she first rose to stardom in Roman Holiday (1953), she was seen as an alternative feminine ideal that appealed more to women than to men, in comparison to the curvy and more sexual Grace Kelly and Elizabeth Taylor. With her short hair style, thick eyebrows, slim body, and "gamine" looks, she presented a look which young women found easier to emulate than those of more sexual film stars. In 1954, fashion photographer Cecil Beaton declared Hepburn the "public embodiment of our new feminine ideal" in Vogue, and wrote that "Nobody ever looked like her before World War II ... Yet we recognise the rightness of this appearance in relation to our historical needs. The proof is that thousands of imitations have appeared." The magazine and its British version frequently reported on her style throughout the following decade. Alongside model Twiggy, Hepburn has been cited as one of the key public figures who made being very slim fashionable. 1 2 Walker 1997, p. 6. ↑ "Anna Juliana Franziska Karolina Wels, born in Slovakia". Pitt.edu. Retrieved 4 May 2013. 1 2 3 Spoto 2006, p. 3. ↑ Segers, Yop. "'Heemstra, Aarnoud Jan Anne Aleid baron van (1871–1957)',". Historici.nl. Retrieved 23 October 2013. 1 2 3 4 5 6 7 8 9 10 11 12 13 14 15 Paris 2001. ↑ "Ian van Ufford Quarles Obituary". The Times. 29 May 2010. Archived from the original on 21 June 2016. Retrieved 31 May 2010. ↑ vrijdag 6 mei 2011, 07u26. "De vijf hoeken van de wereld: Amerika in Elsene". brusselnieuws.be. Retrieved 14 March 2012. 1 2 Walker 1997, p. 8. ↑ "Famous and Notable People 'In and Around' the Elham Valley". Elham.co.uk. Retrieved 4 September 2009. ↑ Klein, Edward (5 March 1989). "You Can't Love Without the Fear of Losing". Parade: 4–6. ↑ Cronin, Emily (20 August 2017). "Couture, pearls and a Breakfast at Tiffany's script: inside the private collection of Audrey Hepburn". The Telegraph. ISSN 0307-1235. Retrieved 20 September 2017. ↑ Johnson, Richard (2018-10-29). "Audrey Hepburn reportedly helped resist Nazis in Holland during WWII". Fox News. Retrieved 2018-10-30. ↑ Tichner, Martha (26 November 2006). "Audrey Hepburn". CBS Sunday Morning. 1 2 James, Caryn (1993). "Audrey Hepburn, actress, Is Dead at 63". The New York Times. Archived from the original on 18 January 2007. Retrieved 26 November 2006. 1 2 Woodward 2012, p. 52. ↑ "Audrey Hepburn's Son Remembers Her Life". Larry King Live. 24 December 2003. CNN. ↑ "Princess Apparent". Time. 7 September 1953. ↑ "The Silent Village (1951)". BFI. Retrieved 4 October 2017. 1 2 "History Lesson! Learn How Colette, Audrey Hepburn, Leslie Caron & Vanessa Hudgens Transformed Gigi". Broadway.com. Retrieved 17 September 2015. 1 2 "Audrey Is a Hit". Life. 10 December 1951. Retrieved 22 April 2016. ↑ Weiler, A. W. (28 August 1953). 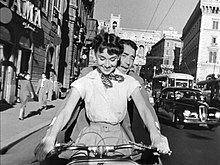 "'Roman Holiday' at Music Hall Is Modern Fairy Tale Starring Peck and Audrey Hepburn". The New York Times. Archived from the original on 11 August 2011. Retrieved 14 January 2008. ↑ "Audrey Hepburn: Behind the sparkle of rhinestones, a diamond's glow". TIME. 7 September 1953. Archived from the original on 12 May 2009. Retrieved 28 May 2009. ↑ Crowther, Bosley (23 September 1954). "Screen: 'Sabrina' Bows at Criterion; Billy Wilder Produces and Directs Comedy". The New York Times. ↑ "Mel Ferrer". The Daily Telegraph. Retrieved 27 April 2017. ↑ "Hepburn's Golden Globe nominations and awards". Golden Globes. 14 January 2010. Archived from the original on 8 April 2010. Retrieved 10 March 2010. ↑ "Filmography: The Nun's Story". audrey1.com. Archived from the original on 14 February 2006. Retrieved 14 January 2008. 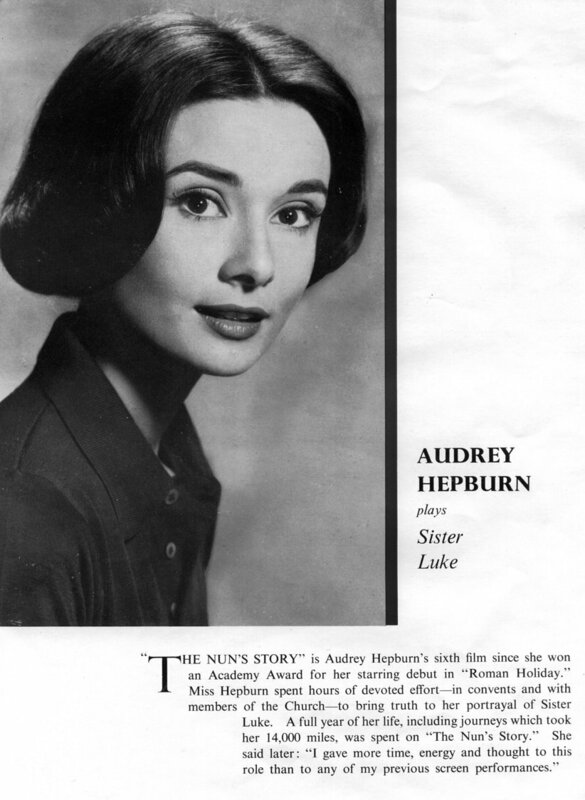 ↑ "Audrey Hepburn plays Sister Luke". audreyhepburnlibrary.com [expired domain]. 1959. Archived from the original on 27 July 2011. Retrieved 5 May 2014. ↑ Crowther, Bosley (20 March 1959). "Delicate Enchantment of 'Green Mansions'; Audrey Hepburn Stars in Role of Rima". The New York Times. ↑ Crowther, Bosley (7 April 1960). "Screen: "The Unforgiven': Huston Film Stars Miss Hepburn, Lancaster". The New York Times. ↑ Capote & Inge; 1987. 1 2 "Audrey Hepburn: Style icon". BBC News. 4 May 2004. ↑ "The Most Famous Dresses Ever". Glamour. April 2007. Retrieved 16 May 2011. ↑ "Audrey Hepburn dress". Hello Magazine. 6 December 2006. ↑ "Audrey Hepburn's little black dress tops fashion list". The Independent. UK. 17 May 2010. Retrieved 16 May 2011. ↑ Crowther, Bosley (15 March 1962). "The Screen: New 'Children's Hour': Another Film Version of Play Arrives Shirley MacLaine and Audrey Hepburn Star". The New York Times. ↑ "The Children's Hour". Variety. 31 December 1960. ↑ Crowther, Bosley (6 December 1963). "Screen: Audrey Hepburn and Grant in 'Charade': Comedy-Melodrama Is at the Music Hall Production Abounds in Ghoulish Humor". The New York Times. 1 2 3 Eleanor Quin. "Paris When It Sizzles: Overview Article". Turner Classic Movies. Retrieved 27 May 2009. 1 2 "Paris When It Sizzles". Variety. 1 January 1964. Retrieved 28 May 2009. 1 2 Crowther, Bosley (22 October 1964). "Screen: Lots of Chocolates for Miss Eliza Doolittle: 'My Fair Lady' Bows at the Criterion". The New York Times. 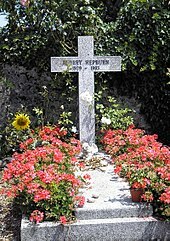 1 2 "Audrey Hepburn obituary". The Daily Telegraph. London. 22 January 1993. ↑ Crowther, Bosley (27 October 1967). "The Screen: Audrey Hepburn Stars in 'Wait Until Dark'". The New York Times. ↑ "EGOT winners Taylor Swift is chasing". NY Daily News. Retrieved 27 April 2017. ↑ "Classics | United Nations Audiovisual Library". www.unmultimedia.org. Retrieved 27 April 2017. ↑ "Audrey Hepburn". UNICEF. Retrieved 27 April 2017. ↑ "Audrey Hepburn – Ambassador of Children". audrey1.com. Retrieved 14 January 2008. 1 2 3 "Audrey Hepburn's UNICEF Field Missions". Retrieved 22 December 2013. ↑ "The Din of Silence". Newsweek. 12 October 1992. 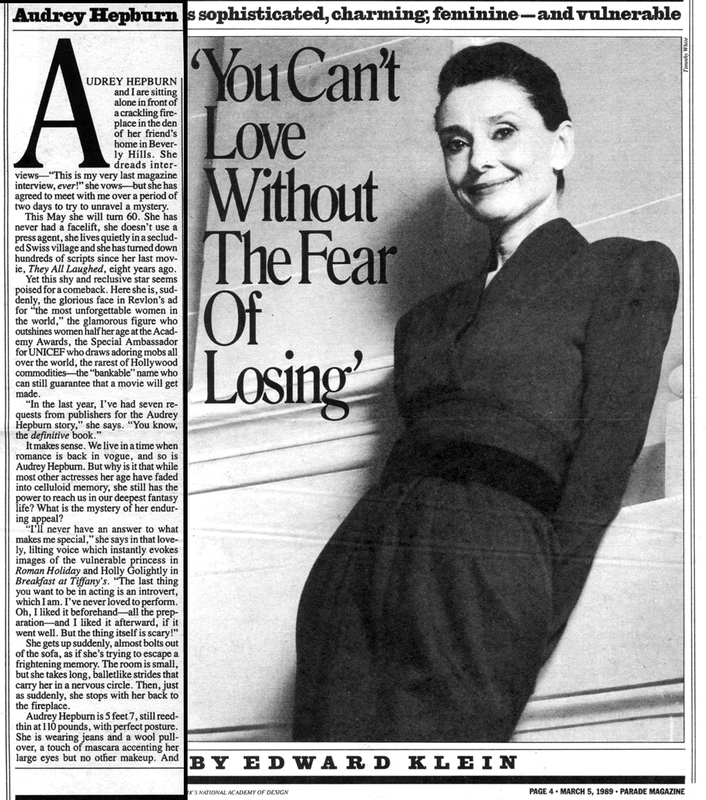 ↑ "Was Audrey Hepburn, the Queen of Polyglotism?". news.biharprabha.com. Retrieved 3 May 2014. ↑ "Audrey Hepburn's work for the world's children honoured". unicef.org. Retrieved 8 May 2013. ↑ "U.N. Hosts Special Session on Children's Rights". cnn.com. 7 February 2001. Retrieved 8 May 2013. 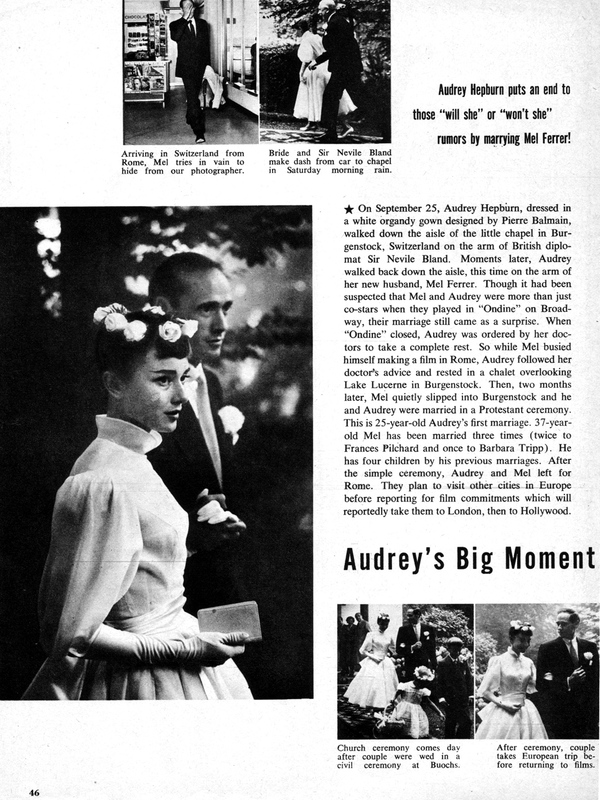 ↑ "Audrey Hepburn puts an end to "will she" or "won't she" rumors by marrying Mel Ferrer!". audreyhepburnlibrary.com [expired domain]. 1954. Archived from the original on 6 December 2010. Retrieved 5 May 2014. ↑ "Audrey Hepburn Timeline 1960–1969". audrey1.org. Retrieved 5 July 2015. ↑ "Mel Ferrer obituary". Daily Telegraph. 4 June 2008. Retrieved 3 May 2017. ↑ "An Audrey Hepburn Biography: 1955–1975". audrey1.com. Retrieved 14 January 2008. ↑ Genzlinger, Neil (3 February 2012). "Ben Gazzara, Actor of Stage and Screen, Dies at 81". The New York Times. ↑ "Audrey Hepburn obituary". Daily Telegraph. 22 January 1993. Retrieved 3 May 2017. ↑ Heatley, Michael (2017). Audrey Hepburn: In words and pictures. Book Sales. p. 166. ISBN 0-7858-3534-2. ↑ "Selim Jocelyn, ""The Fairest of All", CR Magazine, Fall 2009". Crmagazine.org. Archived from the original on 19 April 2010. Retrieved 10 March 2010. ↑ "Two favorite poems of Audrey Hepburn". audrey1.com. Archived from the original on 8 January 2007. Retrieved 14 January 2008. ↑ Binder, David (25 January 1993). "Hepburn's Role As Ambassador Is Paid Tribute". The New York Times. ↑ "A Gentle Goodbye -Surrounded by the Men She Loved, the Star Was Laid to Rest on a Swiss Hilltop". People. 1 January 1993. ↑ Ruiz, Karen (15 December 2017). "EXCLUSIVE: Audrey Hepburn's will revealed!". ↑ "Audrey Hepburn Children's Fund – Legacy". Audreyhepburn.com. Retrieved 19 April 2014. ↑ Tynan, William (27 March 2000). "The Audrey Hepburn Story". TIME. Retrieved 10 March 2010. ↑ Christopher, James (12 January 2009). "The best British film actresses of all time". The Times. London. Retrieved 4 May 2010. ↑ "New Gap marketing campaign featuring original film footage of Audrey Hepburn helps Gap "Keeps it Simple" this Fall – WBOC-TV 16". Web.archive.org. 28 September 2007. Archived from the original on 28 September 2007. Retrieved 6 September 2010. ↑ Usborne, Simon (24 February 2013). "Audrey Hepburn advertise Galaxy chocolate bars? Over her dead body!". The Independent. London. Retrieved 28 February 2013. ↑ "Audrey Hepburn digitaly reborn for Galaxy". 1 March 2013. Retrieved 18 November 2014. ↑ Grossman, Samantha (4 May 2014). "Google Doodle Pays Tribute to Audrey Hepburn". Time. Retrieved 9 March 2017. ↑ AHCF. "Audrey Hepburn Children's Fund – Photographs – video – donations – woman accessories – bag". audreyhepburn.com. Retrieved 17 September 2015. ↑ "Audrey Hepburn® Society Chair". UNICEF USA. Retrieved 17 September 2015. ↑ "Sean Hepburn Ferrer – Pseudomyxoma Survivor". Pseudomyxoma Survivor. Retrieved 5 July 2015. ↑ "Rare Disease Day ® 2015 – Sean Hepburn Ferrer, special ambassador of Rare Disease Day 2014". Rare Disease Day – Feb 28 2015. Retrieved 5 July 2015. ↑ Billson, Anne (29 December 2014). "Audrey Hepburn: a new kind of movie star". The Daily Telegraph. London. 1 2 Hill 2004, p. 78. 1 2 3 4 Moseley, Rachel (7 March 2004). "Audrey Hepburn – everybody's fashion icon". The Guardian. Retrieved 23 April 2016. 1 2 Lane, Megan (7 April 2006). "Audrey Hepburn: Why the fuss?". BBC News. BBC. ↑ Naomi Harriet (19 August 2016). "80s Fashion Trends, Reborn!s". La Rue Moderne. Archived from the original on 21 August 2016. Retrieved 23 September 2016. 1 2 3 4 Collins, Amy Fine (3 February 2014). "When Hubert Met Audrey". Vanity Fair. Retrieved 23 April 2016. 1 2 Zarrella, Katharine K. "Hubert de Givenchy & Audrey Hepburn". V Magazine. Archived from the original on 10 May 2015. Retrieved 23 April 2016. ↑ Haria, Sonia (4 August 2012). "Beauty Icon: Givenchy's L'Interdit". The Daily Telegraph. Retrieved 23 April 2016. ↑ "Hepburn revival feeding false image?". The Age. Melbourne, Australia. 2 October 2006. ↑ "Audrey Hepburn tops beauty poll". BBC NEWS. 31 May 2004. ↑ Sinclair, Lulu (1 July 2010). "Actress Tops Poll of 20th Century Beauties". Sky. Retrieved 14 August 2015. ↑ Sharkey, Linda (27 April 2015). "Audrey Hepburn is officially Britain's style icon – 22 years after her death". The Independent. Retrieved 23 April 2016. ↑ Dahl, Melissa (11 December 2006). "Stylebook: Hepburn gown fetches record price". Pittsburgh Post-Gazette. Retrieved 1 January 2010. ↑ "Marilyn Monroe "subway" dress sells for $4.6 million". Reuters. 19 June 2011. Retrieved 29 June 2011. ↑ "Auction Frenzy over Hepburn dress". BBC NEWS. 5 December 2006.